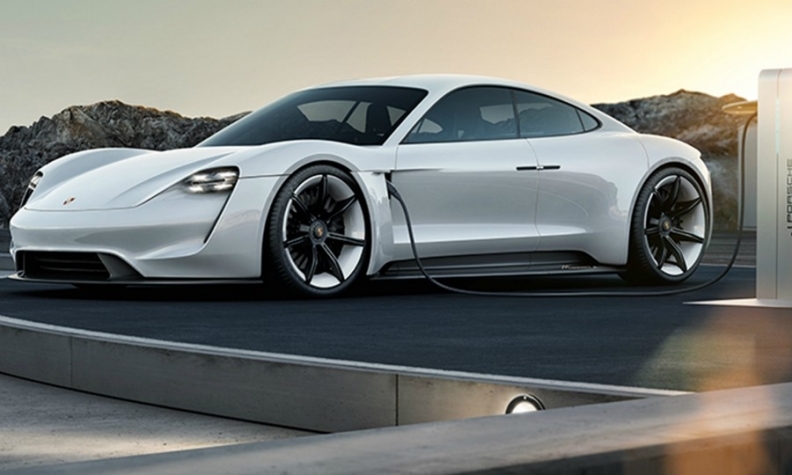 Porsche's first EV, based on the Mission E concept, pictured, is due to start production in 2019. BEIJING -- Porsche set one of the industry's most aggressive targets for selling plug-in hybrid and battery-powered cars, predicting the vehicles will make up as many as half of its deliveries by 2025 in a sign the shift to electrified models is speeding up. The Volkswagen Group brand is readying the full-electric Mission E sports car for sale next year, and has pledged to add variants such as a four-door Cross Turismo concept that it showed in March. Porsche is now comfortable setting a goal for electrified models to comprise 50 percent of sales, double the figure predicted last month, as wider offerings and Chinese policies power demand, division sales chief Detlev von Platen said on Wednesday. "The train for electric mobility has well and truly left the station," von Platen said in an interview at the Beijing auto show. "China is and will remain the biggest market for electric cars for the foreseeable future." The quicker pace follows VW's appointment of Herbert Diess as group CEO. The executive has said repeatedly, including at the Beijing show on Tuesday, that he wants the automaker to adapt faster to the accelerating technology shift hitting the industry. Porsche, VW's most profitable brand by return on sales, has committed to a fundamental overhaul to sustain its industry-leading margins. Banking on a three-pronged strategy of optimizing combustion engines, plug-in hybrids and EVs, Porsche is already seeing customers respond. Some 60 percent of buyers of the updated Panamera four-door coupe in Europe are opting for the hybrid version. The technology for the next generation of Porsche's iconic 911 sports car will also allow integration of a battery that could provide an extra boost. Porsche, which this year celebrates the 70th anniversary of its first sports car, needs to bolster returns as Audi, the division that's Volkswagen's largest earnings contributor, wrestles with the fallout from the group's diesel-emissions scandal that erupted in 2015. That unit has lost ground in both sales volume and profitability to rivals Mercedes-Benz and BMW. Porsche and Audi plan to deepen cooperation to reap development-cost savings. Under a new setup Diess outlined two weeks ago, Porsche will be grouped with other ultraluxury brands, including Lamborghini and Bugatti. The latest attempt at streamlining Volkswagen's unwieldy 12-brand behemoth will help bundle more synergies and speed up the rate of change, von Platen said. Porsche's global deliveries reached a fresh annual record in 2017, rising almost 4 percent to 246,000 cars. Rapid volume growth in recent years has been largely driven by adding the compact Macan SUV to the lineup. EDITOR'S NOTE: An earlier version of this story misstated the date for Porsche's EV forecast.